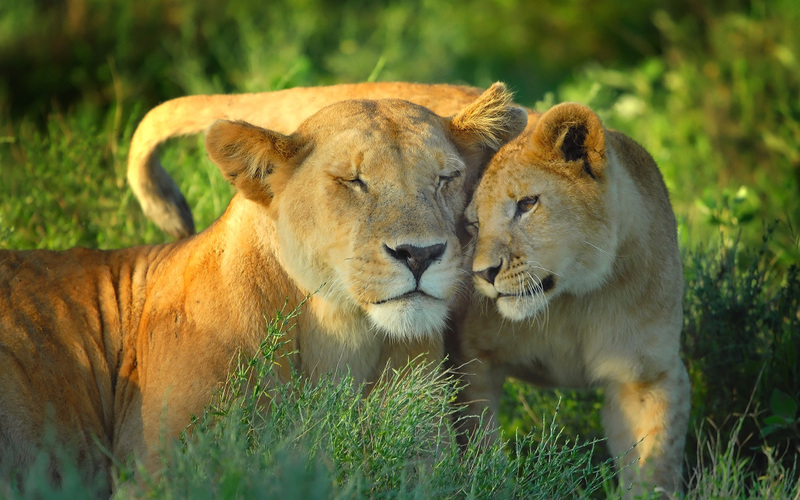 A lion conservation project led by Dr Amy Dickman of WildCRU, Department of Zoology has won an award in this year’s Vice-Chancellor’s Public Engagement with Research Awards, which celebrate public engagement work across the University. The announcement was made at an awards ceremony at the Oxford University Museum of Natural History on 28 June hosted by Vice-Chancellor Professor Louise Richardson. The winning project was recognised in the Project Award category – for projects that have informed, inspired and collaborated with the public. The award-winning project Transforming Lion Killers into Lion Conservationists: Engaging the Public in Tanzania’s Ruaha Landscape aimed to educate communities in Tanzania’s Ruaha landscape, which holds the world’s second largest lion population, but also has extremely high rates of lion killing by local people. The project conducted educational Park visits for villagers to learn first-hand about wildlife conservation. Ruaha is East Africa’s biggest National Park, but under-resourced local people are unable to visit it. They therefore only experience wildlife when it is posing a danger to them, and are antagonistic towards the Park and its wildlife. To date over 1000 people from 16 villages have participated and over 95% report improved attitudes towards wildlife. The project also organises educational DVD nights and has engaged over 30,000 local villagers, communicating information about wildlife conservation and the status of lions. Officers in 10 villages have been trained on best-practice livestock protection methods, and young warriors are employed to track lions, prevent lion hunts and protect communities and livestock from lions. Lion killing has reduced by over 90% in the core study area, and the project team are now training other projects in these approaches. The project has also provided over 30 secondary school scholarships, local clinics and schools with vital equipment, and over 350 children daily with free school lunches. The project currently employs over 60 people, who indirectly support over 600 people. The Vice-Chancellor’s Public Engagement with Research Awards recognise and reward those at the University who undertake high-quality engagement activities and have contributed to building capacity in this area. Transforming Lion Killers into Lion Conservationists was one of six winners in the Project category of the awards. The Vice-Chancellor’s Public Engagement with Research Awards recognise and reward those at the University who undertake high-quality engagement activities and have contributed to building capacity in this area. The awards are awarded in three categories – Early Career Researcher, Building Capacity and Projects. Entrants can be at any level in their career and activities of any scale are welcome. Winning entries received recognition for their achievements at the Vice-Chancellor’s Public Engagement with Research Awards Ceremony, which took place on 28 June 2017. The latest monthly report from Dr Dickman’s Ruaha Carnivore Conservation Project is available here.